Following are excerpts from an interview with US Supreme Court justice Ruth Bader Ginsburg, which aired on Al-Hayat TV on January 30, 2012. Ruth Bader Ginsburg: It is a very inspiring time – that you have overthrown a dictator, and that you are striving to achieve a genuine democracy. So I think people in the United States are hoping that this transition will work, and that there will genuinely be a government of, by, and for the people. 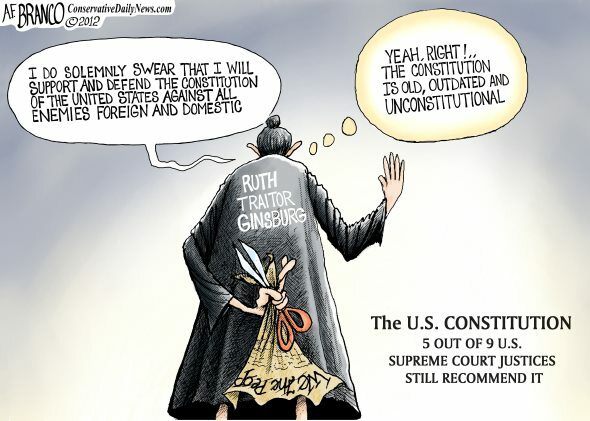 In other words, the very Constitution she has sworn to uphold is, in her own words, outdated. No d@mned wonder this wench looks to foreign law to mold her leftist decisions: she doesn’t think very highly of our own laws, statutory or constitutional. As the Spectator notes, while she was praising the freedoms found in our First Amendment, she was oblivious to the fact that those rights are far less protected in South Africa, Canada, and Europe than they are here. Maybe she’s racist for not wanting those rights extended to Egyptians? If Uhhhhhhbama gets re-elected, he will look to find another one of these anti-American jackwagons to sit on the SCOTUS in the event of another vacancy. It is shameful that such a moron serves on the bench of the Supreme Court. CIA Director Leon Panetta helped touch off an avalanche of erroneous expectations Thursday when he testified that there was a “strong likelihood” that Egyptian President Hosni Mubarak would step down by the end of the day. Within minutes, senior aides to Panetta sought to tamp down the impact, saying he was merely referring to media reports. But by then, the comments had ricocheted around the Internet, underscoring U.S. confusion about events unfolding in Egypt, as well as the perils of publicly weighing in on such developments while serving as director of CIA. Shortly thereafter, a U.S. intelligence official said that Panetta “was clearly referring to press reports alluded to” by the panel chairman, Rep. Mike Rogers (R-Mich.). The explanation that Panetta was citing news accounts protected him from being on the hook if the prediction turned out not to be true. But it also carried a more subtle public relations risk, suggesting that the CIA chief was not necessarily any better informed than others at Thursday’s hearing, scanning their cellphones for breaking news. “The term ‘Muslim Brotherhood’…is an umbrella term for a variety of movements, in the case of Egypt, a very heterogeneous group, largely secular, which has eschewed violence and has decried Al Qaeda as a perversion of Islam,” Clapper said. We’re in good hands, my friends. Please let November 2012 get here post haste.